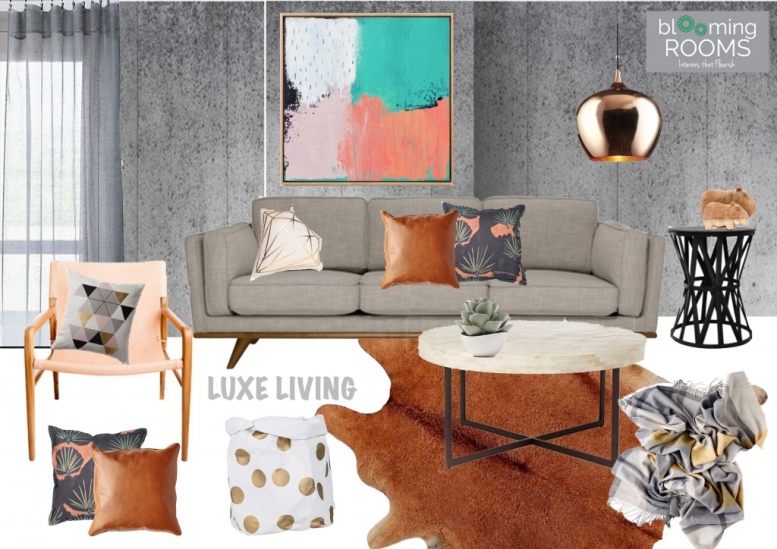 There’s just something about this moodboard that spells luxe living but for me it’s the myriad of textures on display and the lovely combination of leather and concrete (with a splash of gold and copper) that makes this a winning space. So if welcoming in 2016 has given you a hankering to update your living room and you have some solid core pieces already like an upholstered sofa in a neutral colour then an update doesn’t have to be expensive or time consuming. The concrete wall can be cost effectively achieved using some of the great wallpapers now available and you can add leather in cushions, a natural hide rug and if your budget permits a beautiful soft leather chair. Make sure you stick to a simple colour scheme – here we have used blush and teal to give the space a pop of colour! 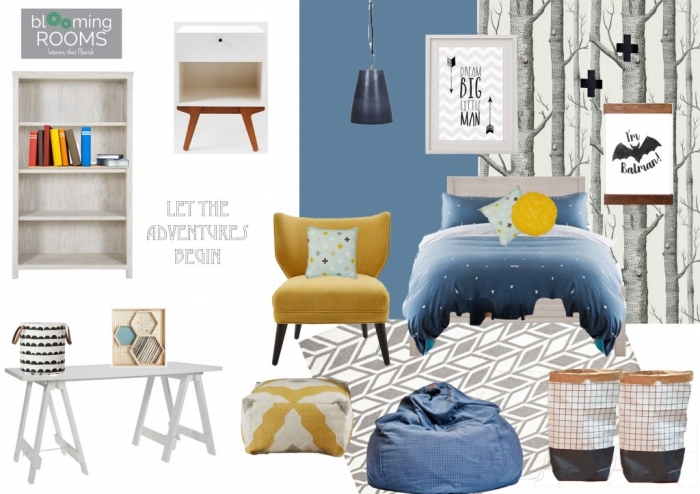 Want to find out more about this mood board and the gorgeous homewares featured – feel free to pop us a line and I would be more than happy to assist. In need of some inspiration for a younger boys bedroom but not sure where to start! 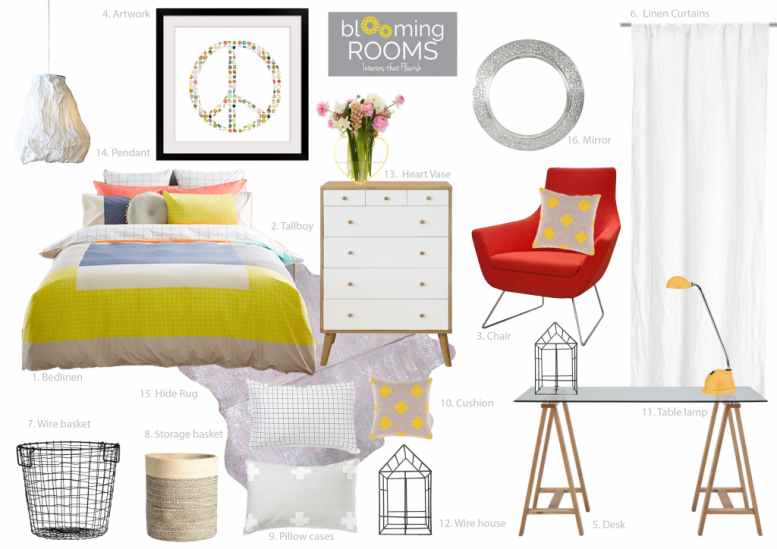 This month we have featured a very cool bedroom design for a boy aged anywhere from early school till his tweens! Perfect if you are trying to update his room as he starts school but want key furniture pieces that will last through his teens. The bed, desk, side table and chair are all timeless pieces but we have added some great prints, wallpaper and other storage and soft furnishings that will make the room fun, exciting and colourful for any boy. In fact it really reminds me a little of Where the Wild Things Are but with some cool Batman additions. For more mood board inspiration or to purchase a copy of the moodboard with a full list of suppliers click here. And let the adventures begin! If you are anything like me, a home office starts tidy at the beginning of the year and then progressively over time accumulates paperwork and stuff till one day it looks like disorganised chaos! But with a little de-cluttering, some good storage, and a dash of creativity and fun – your home office can become a room that you love coming into and even better, inspires you to work! With the summer holidays almost over and most of us back to work, now is a great time to think about a home office update. In need of a little back to work inspiration? Check out our February monthly mood board for some creative input – and your home office will be transformed in no time! With January almost over, I thought I would share with you the Blooming Rooms Mood Board of the Month which is all about black and white! Decorating in monochrome is a trend – along with metallics and indoor plants! – that is likely to be hanging around for a while, and it’s easy to see why. It’s a scheme that is easy to execute and has huge impact when you enter a room. For more Mood Boards of the Month click here. And stay tuned for some great back to work home office inspiration in our February Mood Board to be published early next week! © 2014 bloomingrooms.com.au | Designed by Gigi & Lulu|ProPhoto Photography Theme by NetRivet, Inc.